Each Tuesday post a completely crazy, messed up photo — one you would normally delete. The subject matter isn’t important — did you take a picture of your thumb? The lens cap? The wrong half of great Aunt Betty? (Really, she usually has a head …) Or perhaps you’ve got a shot of your own nose hairs taken while you were trying to determine why the flash wasn’t working. Whatever your photo goof is, we want to see it! So, let’s all expose our photo flubs. You show me yours and I’ll show you mine! 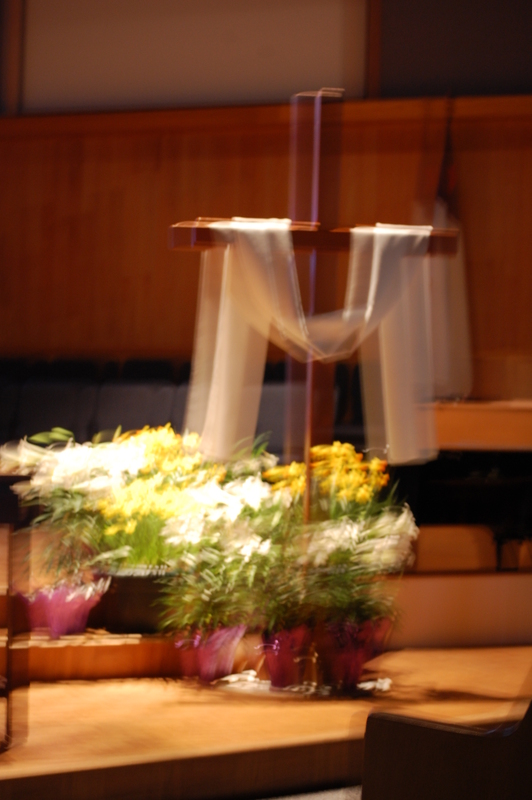 The altar at church should have made a lovely photo, but alas, I couldn’t hold still. Even though the pic looks light, the sanctuary wasn’t well lit and I couldn’t stand still during the longer exposure. I agree…some “muffed” photos are still beautiful. This one is ethereal…fitting for the subject. Atta girl. I love it when you have photos that come out like mine. I was trying to figure out what the M was for before I read the story 🙂 Thanks for playing. You could just say its the reenactment of the earthquake. This is a good choice for Easter with the spirit like cross and Easter lilies. Oh darn! I can still see the beauty through the blur though!